What has always been a routine element of drag racing is becoming a thrilling competition of its own. The State Road and Tollway Authority has partnered with Atlanta Motor Speedway as the presenting sponsor of the "Peach Pass Burnout Zone" at O'Reilly Auto Parts Friday Night Drags. A burnout is a critical component of a competitor's run. A driver's burnout is used to help clean and heat the tires in an effort to provide more grip and a faster start off the line. Fans will be treated to an intense, bone-rattling smoke show each night of the season. "My goal for a burnout is to get the tires hot enough so when I take off, I don't spin the tires", said Peachtree City's Mike Moore, driver of a 2017 Chevrolet Copo Camaro. "It is probably one of the most important things you could do to get a good start." Beginning this week, one division will be chosen to participate in the competition. 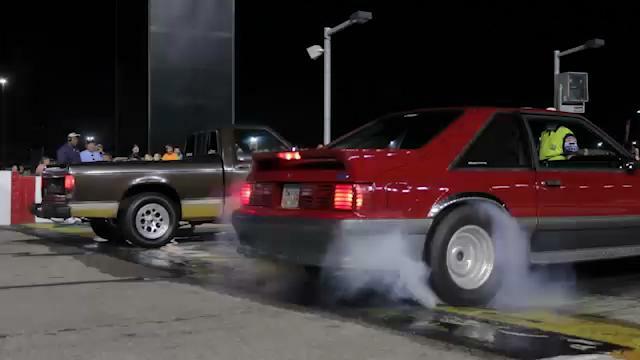 First round eliminations will be judged by the crowd, and the competitor whose burnout receives the loudest reaction will be declared the winner. "The Peach Pass Burnout of the Night" will be recognized via social media with a trophy presentation in Victory Lane at the conclusion of Friday Night Drags. Peach Pass is connected to an account established with the State Road and Tollway Authority (SRTA) that automatically deducts the proper tolls when using Georgia Express Lanes. These lanes give commuters the option to bypass traffic along interstates that are within some of the most congested corridors in metro Atlanta. Available on I-85 North of Atlanta, on I-75 South of Atlanta, and opening soon on I-75 and I-575 North of Atlanta, the Express Lanes provide commuters with an option to get where they need to be faster. Peach Pass representatives will be on hand during the O'Reilly Auto Parts Friday Night Drags season providing fans with the benefits of the I-75 South Metro Express Lanes and outfitting them in Peach Pass gear. Fans can also sign up for a Peach Pass on-site for just a $20 deposit. "The I-75 South Metro Express Lanes provide motorists with an option to get where they are going faster," said Ericka Davis, chief communications officer, State Road and Tollway Authority. "We are thrilled to partner with Atlanta Motor Speedway and we look forward to some great Peach Pass Burnout Zone competitions." Peach Pass holders will also have access to an exclusive VIP viewing area directly along the drag strip. SRTA is a state-level, independent Authority created to operate tolled transportation facilities within Georgia and act as the transportation financing arm for the state. SRTA manages the collection of tolls on Georgia's Express Lanes System through the use of Peach Pass; administers the Atlanta region's vanpool program; and manages the Xpress regional commuter coach transit service. In 2017, SRTA combined with the Georgia Regional Transportation Authority (GRTA) to jointly provide the services of both state authorities. The GRTA board continues to oversee developments of regional impact, air quality reporting and regional transportation plan approval.